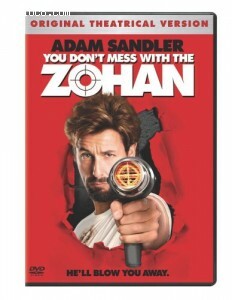 This page contains easter eggs for the disc You Don't Mess With the Zohan (Rated Single-Disc Edition) (DVD, Region 1). Highlight "Special Features " on the Main Menu and press your Left button. A flying Zohan will appear. Press your Enter button for a gag with a wig. In the Special Features menu, highlight "Previews", then press your left button. A flying Zohan will appear. Press your Enter button for a crew dance version of Disco-Disco.